Championship strugglers Scunthorpe United have signed Nottingham Forest defender Brendan Moloney on loan for the rest of the season. 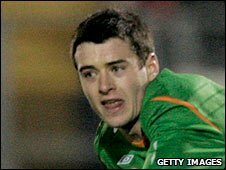 The 21-year-old right-back, who can also play in midfield, has won six Under-21 caps for Republic of Ireland. He came through the ranks at the City Ground and has made 15 league appearances for Forest. He has previously been on loan at Chesterfield, Rushden & Diamonds and Notts County.